Omar Rbati is a Senior Technology Executive with over 20 years of experience in leading the architecture, design and delivery of large scale, mission critical enterprise solutions, transformation and integration solutions across Banking, Telecommunication, Manufacturing and Insurance industries. He has extensive experience in leading and executing the delivery of enterprise solutioning and architectures, IT strategies, assessments & roadmaps and technology enablements across many Fortune 500 companies. 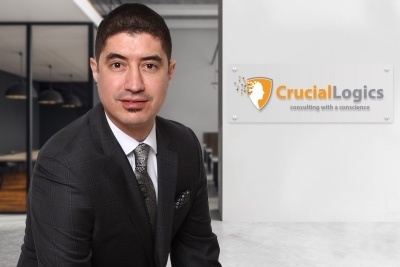 At CrucialLogics through Consulting with a Conscience™, Omar, combining his deep technology and business expertise with a proven track record of advising clients and delivering innovative solutions, leads our Advanced Architectures and SparkIT practices. Omar Rbati leads the practices working with clients in all segments to deliver IT projects covering cloud computing, IT strategy and operations, and system management leveraging Microsoft technologies. Omar is a well-rounded IT authority and able to draw upon a wide array of expertise to distill custom-made solutions specific to a single company’s unique needs. He can provide a top level strategic perspective and help clients all the way through to deployment and management, dedicated to ensuring that the right solution is in place. Omar has a degree in Information Systems Management (ISMG), is a Microsoft Certified Professional in multiple technologies (MCP, MCSE, MCITP) and is also a Microsoft Solutions Expert. CrucialLogics © 2019 – a CriticalMatrix Company.